This is the “history” bits that might be helpful in getting things together. In our Churchyard one of the large monuments has a large stone on top which indicates a Wool Merchant. So there were a lot of sheep here at one time. I read once that the population nearly doubled from about 1811 to about 1850. I feel it was due to activity in the quarries. There are many quarries in the Burford Road. The remains are like a cliff behind the houses and here there are large open spaces of disused quarries. The population grew and I have been told of many cottages built then with Welsh Slate roofs. At the top of Chapel Hill, opposite the Chapel, there was a pub. I don’t know the name. Further down, opposite the Manor entrance there is a farm gate. It led to a spectacular avenue of Elm Trees which is said to have led to a house called Norton House. I know no more. I went to a sale or something held there. They used that in preference to the Rec which was a field after the Curbridge Road Council Houses. It was too far out of the village, people wanted to use “Benny” for Rec. After a long time, that’s how it turned out only Benny is called Elderbank. To get back to the trees, a severe gale in October 1929 blew most of them down. There is a patch of grass in front of Manor Cottages. That was the Pound where stray animals were kept. There used to be the base of a cross. It must have been removed to make room for the War Memorial. The thatched cottage near the church has a garden in front and a space where they sometimes kept a car. That space was where the village lock-up was situated. Marsh Haddon was the idyllic part of Brize Norton. It was at the end of a drive which led from the Bampton Road, about half way between the last house of the village and the Railway Bridge. A handsome Cotswold farm house with a beautiful garden and a pond. A terrace of 4 cottages each separated and the Bluecopse nearby. Everyone seemed to love it, but when the Americans came, the Landing Ground was enlarged and it had to go. I heard the farm house was removed piece by piece, shipped to America where it was to be rebuilt for use as an officer’s mess. 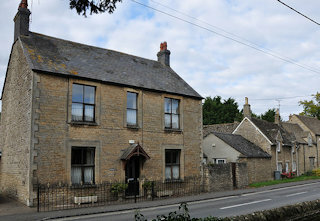 At Field View House, which was once three cottages, the cottage nearest the road was a Dame School. I have read that someone left money to pay for a teacher to teach Brize Norton Children to read and write. They used to say that the Back Road was the original road to Bampton. Some of it is still available but the Landing Ground is in the way. It begins from opposite the Chequers. There is a little gate which leads to the Rec. It used to be a stile. The route runs to the Allotment wall, where there is a climbing point. Some flat stones on the wall. The path continues as far as Cockhatch and the RAF fence. It runs past our house but it’s overgrown after that. The path comes out near Bampton Church. The Sallies was the most dangerous spot in Brize. There was talk of a man disappearing for ever into the marsh and, of course, the Kingcups and wild irises were beautiful. I think the story was to keep children away. The brooks run from there of course of where it flowed through the Vicarage ground it was called the Parson’s Brook, but further down it was the Land Ditch. There were 3 fields of allotments called collectively “The Land” hence Land Ditch. A couple of fields further on we came to the Cuckoo Pen. The banks of the brook had been widened making a pool of water. It was our only paddling pool; sometimes mothers and aunties would come and picnic. It was joyful for us. The brook runs on Cockhatch. In the thirties there were still a few horse drawn vehicles. The coalman, the milkman, one of the bakers, Benny the rag & bone man from Carterton and a man who sold greengrocery & fish, but of course the one we liked was the horse drawn fish & chip van on a Saturday night. A pennyworth of chips in a paper bag with vinegar. Children used to love vinegar. Sometimes there was fun and it was on those occasions when we experienced joy of being a small happy community. Sometimes there were concerts in our village hall, the Hut. We used to have our local comedian who came from Asthal and brought a few other entertainers with him. Whatever, the humour we enjoyed it especially if he spoke in the very old fashioned and extreme form of the local dialect. We would sing, laugh and stamp our feet and get redder and redder. A wonderful community feeling. We had socials as well and two of the men made up amusing verses about Brize, its people. Again delightful! Then there was a saying going round that there was going to be an aerodrome at Brize Norton. Some people understood but many of us 3thought it wasn’t possible. We were not important enough. They felt it was a mistake and it was Witney aerodrome that was meant. However, one weekend in our walks we found pegs in the ground marking the extent of the ‘drome. After that things happened because of the aerodrome. Electricity was for us as well. Also we had a main water supply for the first time. Standing water pipes were placed outside to cover 3 or 4 houses. Trees were felled and hedges pulled up. Every weekend on our walks to see how things were going we noticed the changes. The spectacle drew in the crowd. Then work went on building. It was a time when there was unemployment in the industrial areas. There was work here and men came from all parts of the UK bringing with them unfamiliar dialects and a kind of presence not familiar to us in our quiet agricultural lifestyle. Men needed accommodation. Some of the largest businesses had a Hostel, but many needed lodgings. Quite a lot of Brize Norton people took lodgers (but not people with children). There always seemed plenty of people walking about the village and of course the pubs were very lively. They worked Saturday mornings and in the afternoon crowds of them walked down the road to catch the 2.30 train. Some went home for the weekend. Then at last it was finished and there was a celebratory Opening one fine summer afternoon in 1937. All the schools closed down that afternoon. We loved it. It began as a flying training school. They had planes called Harvards. You had to stop talking when they went over, the noise was colossal. It’s a thought that those pilots being trained would have taken part in the Battle of Britain. The “barn” was actually a church with a nave, chancel and two transcepts cruciform place. Very rough hewn on a piece of ground surrounded with a ditch (like a haha). The people who lived at the there, at the barn, were Roman Catholic when it was dangerous. Their name was Yates. An old retired farmer from Carterton was proud of the fact he gave Carterton its first Catholic Church. 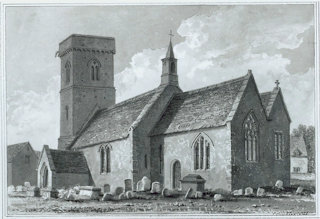 The Greenwoods of the Manor, the back road and this old church at Lower Haddon – connect.